The right to vote is deeply valued by the public: An overwhelming 91% say that they consider the right to vote as essential to their own personal sense of freedom. 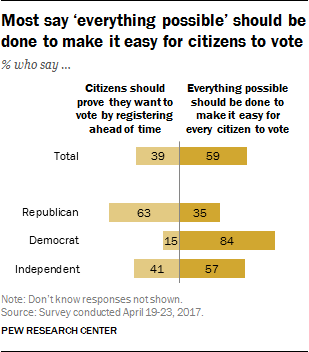 A 59% majority says that everything possible should be done to make it easy for every citizen to vote, while 39% say that citizens should have to prove they really want to vote by registering ahead of time. While the public thinks voting should be easy for citizens and prizes the right to cast a ballot, they oppose mandatory voting. Nearly eight-in-ten (78%) say that every citizen should be able to decide for themselves whether or not to vote in national elections, compared with just 20% who say that all citizens should be required to vote in national elections. These questions were part of a survey conducted in conjunction with the Smithsonian National Museum of American History for its newly opened American Democracy: A Great Leap of Faith exhibition. The national survey by Pew Research Center finds partisans are sharply divided over the question of how easy it should be for citizens to vote. A large majority of Democrats (84%) say that voting should be made as easy as possible for citizens. By contrast, just 35% of Republicans favor making voting as easy as possible, while 63% say citizens should have to prove they really want to vote by registering ahead of time. Among independents, more say it should be easy for citizens to vote (57%) than say they should have to prove they really want to vote (41%). 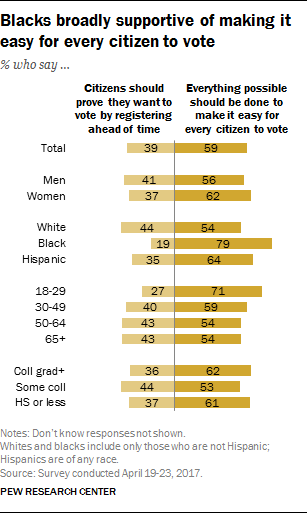 Views about ease of access to voting also differ by age and by race and ethnicity. About seven-in-ten (71%) adults under age 30 believe that everything possible should be done to make it easy for every citizen to vote, while only about a quarter (27%) say that citizens should have to prove they want to vote by registering ahead of time. Although a majority of adults 30 and older (56%) also support making it easy for citizens to vote, roughly four-in-ten (42%) think citizens should have to register in advance. Blacks are more likely than either whites or Hispanics to say voting should be made as easy as possible for citizens: 79% of blacks say this, while just 19% say citizens should have to prove they really want to vote by registering ahead of time. Among whites, a much narrower majority (54%) support making voting as easy as possible for all citizens (44% say citizens should prove they want to vote by registering ahead of time). By 64%-35%, most Hispanics support taking steps to make voting easy for all citizens. There is little difference in views on this question by gender or level of education. Majorities of men and women and those with more and less education say everything possible should be done to make it easy for every citizen to vote. While there is support for making it easy for citizens to vote, the public is largely opposed to making voting required in national elections. Only two-in-ten (20%) would favor mandatory voting, while nearly eight-in-ten (78%) says citizens should be able to decide for themselves whether or not to vote in national elections. Notably, there are no significant differences on this question by partisan affiliation: Large majorities of both Republicans (82%) and Democrats (74%) favor letting citizens decide for themselves whether or not to vote. Majorities across racial and ethnic groups say that citizens should be able to decide for themselves whether they want to vote or not, though support for mandatory voting is higher among Hispanics (36%) and blacks (32%) than among whites (14%). Younger adults (ages 18 to 29) are slightly more likely than those in older age groups to favor making voting in national elections a requirement. However, at least two-thirds of all age groups say citizens should be able to decide whether or not to vote in national elections. The public places a great deal of personal importance on the right to vote. When asked about the importance of five rights and freedoms, the right to vote ranks about as high as any item on the list. Overall, 91% of Americans say that the right to vote is essential to their sense of freedom. Only 7% say it is important but not essential, and just 1% says it is not important. A comparable share (92%) considers freedom of speech to be essential to their own sense of freedom. Large majorities also say the right to privacy (87%) and freedom of religion (85%) are essential to them. Views are more mixed when it comes to the right to own guns: 48% say this is essential, while 33% say it is important but not essential and 19% say it is not important. The importance of the right to vote is widely shared across partisan lines: 96% of Democrats and 91% of Republicans consider it essential to their own sense of freedom.